The holidays are over and it's back to business for the Georgia Museum of Natural History. The curators take up their cudgels. Director Freeman is off to Puerto Rico on the Big Bass Project. 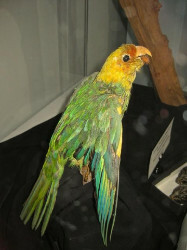 In the gallery -- rare and extinct birds of Georgia. Bring the kiddies to see the birds and explain the causes and consequences of extinction. Mention the importance of protecting habitats with rare animals. The gallery is open Ten till Four, Mondays and Fridays. We're still on "football game time," but look for Saturday morning openings coming up soon. Spring will come, and field trip organizer Dale Hoyt is planning some good ones, so stay tuned.